At any given moment, I have a stack of at least a dozen books that I am reading concurrently. Some end up taking me months to read; others ensnare me and I finish them in days. But always there is this stack, beckoning me. I listen to books on CD in the car and around the house. I set an open book before me while I eat; I have a pile by my bed for those moments right before sleep. Even now, while I am typing this, I have a sandwich on my plate next to my laptop so that I can take a bite between words. Reading them. Writing them. It’s almost a compulsion. 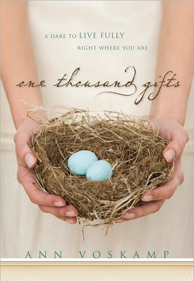 The other night I pulled from my stack One Thousand Gifts, by Ann Voskamp. I set it on the table next to my dinner plate and proceeded to stumble through her opening text, tripping over her lyrical style in my rush to turn the page between forkfuls. “This could have been written so much simpler,” I thought in frustration. It was only the high acclaim of the book that kept me from relegating it to the bottom of my stack. Yes, I admit it. Sometime it takes me a long time to understand the obvious point. And here is the obvious point: this is not a book that can be shoveled in alongside a plateful of spaghetti. After dinner, I moved Ann’s book to my “quiet reading” stack, where it is much more at home. Ann Voskamp’s style serves an interesting purpose for me. It forces me to slow down. It is this trait that initially frustrated me… and ultimately has endeared me. I don’t like to slow down in anything, least of all my reading. There is so much more to read! But Ann’s style forces me to slow down. To read deliberately. To consider the words. To taste the flavor of them. To think. When I let go of the clock, when I accept the fact that I will not “finish this one and start the next one” tonight, it becomes a richer experience. This is not unintentional. I wipe a water spot off the tap; there is a reflection of me. Oh, yes, I know you, the busyness of your life leaving little room for the source of your life. I’m the face grieving. God gives us time. And who has time for God? If anyone should have time, isn’t it the Christ-followers? I do not learn quickly. I still sit here, keyboard at one hand, sandwich at another. Still trying to cram disparate activities into the same moment. But later tonight, I will pause. I will think “I do not have time for this,” but I will do it anyway. I will curl up on my couch with my dog’s head resting on my knee. I will take just one book from my quiet reading stack. I will read just one chapter. Slowly, deliberately, thoughtfully. I will not speed read. But I trust in you, O Lord; I say, “You are my God.” My times are in your hand… (Psalm 31:14-15a).